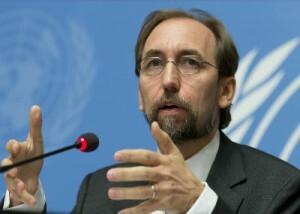 UN High Commissioner for Human Rights Warns on Unraveling of International Agreements. The UN High Commissioner for Human Rights Zeid Ra’ad Al Hussein, has expressed concern at the growing threat to important international agreements. He pointed to the refusal of Burundi to be bound by the jurisdiction of the International Criminal Court and of states such as South Africa and Jordan allowing free movement of the indicted President of Sudan, Omar Hassan Al Bashir. He also noted that the UK is in the process of withdrawing from the European Union, that the US Trump administration is actively considering withdrawal from the UN Human Rights Council and core human rights treaties it has previously ratified such as the International Covenant on Civil and Political Rights, and threatening to withdraw funding from international institutions, and that several Arab countries had even threatened to withdraw from the UN completely. That these steps are contemplated is a sign of a collective amnesia according to the High Commissioner. He urged that the world not forget that international financial institutions; the United Nations; the European Union and the International Criminal Court all arose in response to the catastrophe of two world wars that resulted in more than 100 million deaths. Similarly the international human rights architecture, anchored by the core UN Human Rights treaties, (including the Convention against Torture whose provisions the newly elected US president has openly questioned) provide the principal defence against human stupidity and arrogance which is responsible for so much global violence. The High Commissioner went on to speak of the important role of the Human Rights Council in establishing the facts about human rights violations, – often in the face official obfuscation or denial – in order to respect and obtain redress for victims and just punishment for the perpetrators thereby contributing to durable reconciliation and the prevention of new cycles of conflict.